Description: This is a Dual Tipped Embossing Tool for use with Rubber Stamping and Brass Stencils. 2 different sized ends for detailing. Description: This is a Large Tipped Embossing Tool for use with Rubber Stamping and Brass Stencils. Description: This is a wonderful new Stenciling Kit from The American Traditional Stencil Company. This is a large kit called Asian Motifs. In this kit you get: 6 Plastic Stencils: Water, Fire, Heaven, Earth, Love and Happy, 4 small Crafters Ink Pads in Red, Yellow, Green and Black, 2 Design Sheets, 3 Stencil Brushes, 6 Sachet Bags, 3 Sheets of Plastic, 6 Notecards with Matching Envelopes and 2 Sheets of White Card Stock. Instructions are included to make many projects pictured on the front of the kit and the brushes and inks will last for along time to come~~ This is a large kit which will not qualify for free shipping. 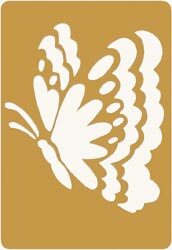 Size: Kit is 8 1/2" x 11"
Description: The American Traditional Stencil Company makes this awesome Paper Piercing template. These are so nice for creating delicate designs with paper. Use with the Paper Piercing tool also sold here. This template comes with full instructions on the package. This reads: Thank You. Size: Template is 3 3/4" x 3"
Description: From the American Traditional Stencil Company comes this elegant looking Stainless Stencil of an Ornate Cross. This template is so nice that you could wear it as a necklace and it would look wonderful!! 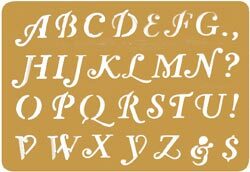 Size: Stencil is 3 1/4" x 2 1/4"
Description: From the American Traditional Stencil Company comes this Stainless Stencil of the Script Alphabet in the 3/8" size. Size: Stencil is 4" x 2 1/2"
Description: From Deja Views comes this wonderful tool for scrapbook journaling. This is set #2 with one plastic template that has 5 different designs to choose from for your words. Description: From Deja Views comes this wonderful tool for scrapbook journaling. This is set #1 with one plastic template that has 6 different designs to choose from for your words. Description: This is a new product from Pop Ups by Plane Class Company. This is called Envy-lope!! It is an envelope system template that will allow you to make 7 different sized envelopes with no glue and no tape. One template to make 7 different envelopes!! Full instructions are on the package back as well. 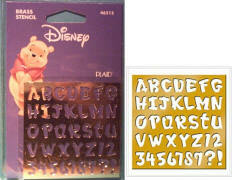 Description: These are mini brass Disney stencils from All Night Media. It has Mickey, Minnie, Donald, Daisy, Goofy and Pluto. Instructions are included how to use these wonderful stencils. These can also be used as charms to embellish your cards and scrapbooks. 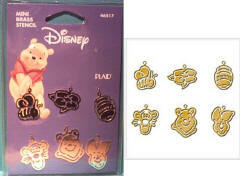 Description: These are mini brass Disney stencils from All Night Media. It has Pooh, Tigger, Piglet, a flower, a honey bee and a honey pot. Instructions are included how to use these wonderful stencils. These can also be used as charms to embellish your cards and scrapbooks. 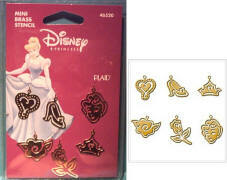 Description: These are mini brass Disney stencils from All Night Media. It has a heart, slipper, Princess, flower, rose and tiarra. Instructions are included how to use these wonderful stencils. These can also be used as charms to embellish your cards and scrapbooks. 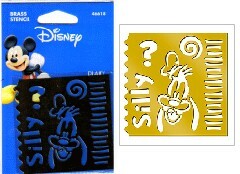 Description: This large brass Disney stencil comes from All Night Media. It is a large Pooh holding a honey pot and has honey bees and flowers. Instructions are included how to use this wonderful stencil. Create stunning embossed design on cards and scrapbooks. 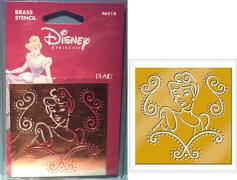 Description: This large brass Disney stencil comes from All Night Media. It is a large princess portrait with dazzle. Instructions are included how to use this wonderful stencil. Create stunning embossed design on cards and scrapbooks. 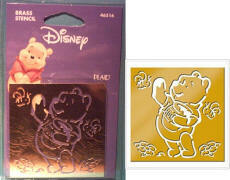 Description: This large brass Disney stencil comes from All Night Media. It is a large Mickey Mouse alphabet with numbers. Instructions are included how to use this wonderful stencil. Create stunning embossed design on cards and scrapbooks. 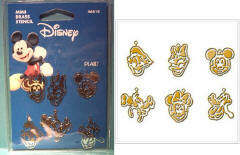 Description: This large brass Disney stencil comes from All Night Media. It is a large Winnie the Pooh alphabet with numbers. Instructions are included how to use this wonderful stencil. Create stunning embossed design on cards and scrapbooks. 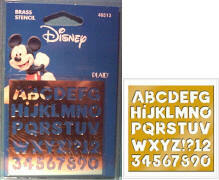 Description: This large brass Disney stencil comes from All Night Media. It is a large Princess alphabet with numbers in script. Instructions are included how to use this wonderful stencil. Create stunning embossed design on cards and scrapbooks. Description: This is a very nice brass stencil from All Night Media. It is a discontinued item so get it while you can! Very Cute and perfect for those Tink collectors. Size: Stencil Size is 3" X 2 3/4"
Description: This stencil is from American Traditional Company. It is made of stainless steel. It is a four leaf clover surrounded by the words "Faith", "Luck", "Hope" and "Love". Use it as a template for dry brushing, use it as a stencil for embossing, or use it as an ornament! 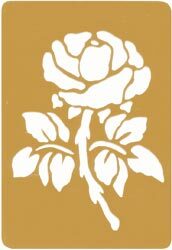 Description: Add beautiful dimension to your paper craft projects with brass stencils from All Night Media�. Made of high-quality, durable brass they can be used with inks and blending chalks for a variety of looks. Plus, these minis can even be used as charms to embellish cards, scrapbooks and other projects. This set is called "Toys" and features a toy soldier, ball, teddy bear and a train. Very cute for Christmas. Description: Add beautiful dimension to your paper craft projects with brass stencils from All Night Media�. Made of high-quality, durable brass they can be used with inks and blending chalks for a variety of looks. Plus, these minis can even be used as charms to embellish cards, scrapbooks and other projects. This set is called "Goodies" and features a candy cane, 2 wrapped hard canies and a cupcake with a cherry on top. Very cute for Christmas. Description: Add beautiful dimension to your paper craft projects with brass stencils from All Night Media�. Made of high-quality, durable brass they can be used with inks and blending chalks for a variety of looks. Plus, these minis can even be used as charms to embellish cards, scrapbooks and other projects. This set is called "Gingerbread" and features a wrapped hard candy, gingerpread man, candy cane and a gingerbread house. Very cute for Christmas. Description: Add beautiful dimension to your paper craft projects with brass stencils from All Night Media�. Made of high-quality, durable brass they can be used with inks and blending chalks for a variety of looks. Plus, these minis can even be used as charms to embellish cards, scrapbooks and other projects. This set is called "Santas Galore" and features Santa Clause, Frosty the Snowman, a mitten and a Christmas tree. Very cute for Christmas. Description: Add beautiful dimension to your paper craft projects with brass stencils from All Night Media�. Made of high-quality, durable brass they can be used with inks and blending chalks for a variety of looks. Plus, these minis can even be used as charms to embellish cards, scrapbooks and other projects. This set is called "Little Greeting" and features the words "Joy", "Noel", "HO HO HO" and "Jolly". Very cute for Christmas. Description: Add beautiful dimension to your paper craft projects with brass stencils from All Night Media�. Made of high-quality, durable brass they can be used with inks and blending chalks for a variety of looks. Plus, these minis can even be used as charms to embellish cards, scrapbooks and other projects. This set is called "Winter Things" and features a snow boot, winter jacket, snowman and a mitten. Very cute for Christmas. 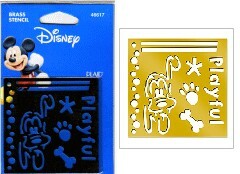 Description: Create fabulous embossed projects with Disney brass stencils featuring all your Disney favorites. This is Goofy! Description: Create fabulous embossed projects with Disney brass stencils featuring all your Disney favorites. This is Pluto! Description: Add beautiful dimension to your paper craft projects with brass stencils from All Night Media�. Made of high-quality, durable brass they can be used with inks and blending chalks for a variety of looks. Plus, these minis can even be used as charms to embellish cards, scrapbooks and other projects. This set called "Hearts" has 4 unique heart designs. Description: Add beautiful dimension to your paper craft projects with brass stencils from All Night Media�. Made of high-quality, durable brass they can be used with inks and blending chalks for a variety of looks. Plus, these minis can even be used as charms to embellish cards, scrapbooks and other projects. This set called "Birthday" has a balloon, cupcake, party hat and a candle. Description: Add beautiful dimension to your paper craft projects with brass stencils from All Night Media�. Made of high-quality, durable brass they can be used with inks and blending chalks for a variety of looks. Plus, these minis can even be used as charms to embellish cards, scrapbooks and other projects. This set called "Beach" has a smiling sun, sandal, sea shell and a fish. Description: Add beautiful dimension to your paper craft projects with brass stencils from All Night Media�. Made of high-quality, durable brass they can be used with inks and blending chalks for a variety of looks. Plus, these minis can even be used as charms to embellish cards, scrapbooks and other projects. This set called "Nautical" has an anchor, ships wheel, sail boat and a light house. Description: Add beautiful dimension to your paper craft projects with brass stencils from All Night Media�. Made of high-quality, durable brass they can be used with inks and blending chalks for a variety of looks. Plus, these minis can even be used as charms to embellish cards, scrapbooks and other projects. This set called "Baby" has a baby bottle, bootie, pacifier and a baby rattle. Description: Nice Alphabet stencil from Darice. Good size for paper crafting. Size: Each letter approximately 3/8" ea. Description: Beautiful embossing stencil from Darice. Made of brass it is a picture of a rose. Size: Image size is 2" X 2 3/4"
Description: Beautiful embossing stencil from Darice. Made of brass it is a picture of a butterfly. Size: Image size is 2" X 2 1/2"